If Cinnamon Toast Crunch has anything to do with it, the days of eating a delicious breakfast and your friends not knowing about it are over. Knowing that its fans shouldn’t have to choose between eating or posting on social media, the company has risen to the occasion with an exciting new creation – the selfie spoon. To celebrate this game-changing invention, Cinnamon Toast Crunch created 1,000 selfie spoons and used its social media channels, influencer, and public relations outreach to help give them away. While the spoons themselves were free, fans did have to pay for shipping and handling. At press time, all 1,000 spoons were spoken for and en route to their new homes. Naturally, what makes this invention a success is seeing fans put the selfie spoon to use. On the dedicated selfie spoon website – powered by Tumblr – fans can compare photos and notes on how to chow down while looking good. As someone who has attempted selfies while biting into a donut all in the name of good social media content, let me tell you, it’s easier said than done. The creativity of this campaign is a good reminder of the power one-of-a-kind items have to get influencers and brand advocates excited. From contest prizes, to surprise gifts, unique branded items are perfect for creating memorable interactions with your company. Inspired by the selfie spoon, here are three tips for creating brand swag that your fans will love. 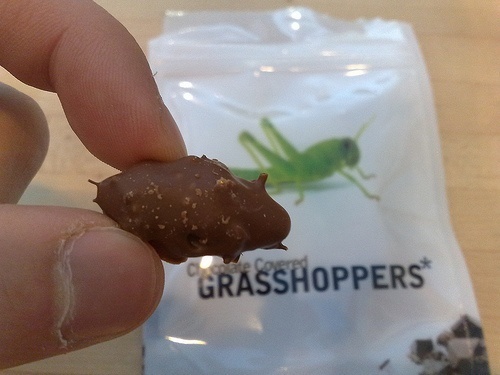 Would you send chocolate covered grasshoppers to influencers and the news media? Well, if your company’s name is Grasshopper – why not? This is exactly what Grasshopper did when re-branding its name from GotVMail. The company, which provides Advanced Phone Numbers to tens of thousands of entrepreneurs across North America, created an inspirational video on the “risk-taking” spirit of entrepreneurs and urged influencers to take an unconventional risk and try a chocolate covered grasshopper. While there were a number of innovative facets of this campaign, the boldness of sending chocolate covered grasshoppers out, combined with people’s willingness to participate, helped drive new levels of reach for the company’s re-branding initiative. However, sending out chocolate-covered grasshoppers would not have been as relevant if it weren’t tied to the company’s name, services or core values. When deciding what’s the right item to send, use those key points as inspiration to derive innovative new ideas from. Half the battle of creating branded items that your fans will love is finding great partners to help bring your vision to life. Taco Bell does a great job of this. After all, the company famously sent a fan a custom Speedo with the phrase “Think outside the buns” on the back. 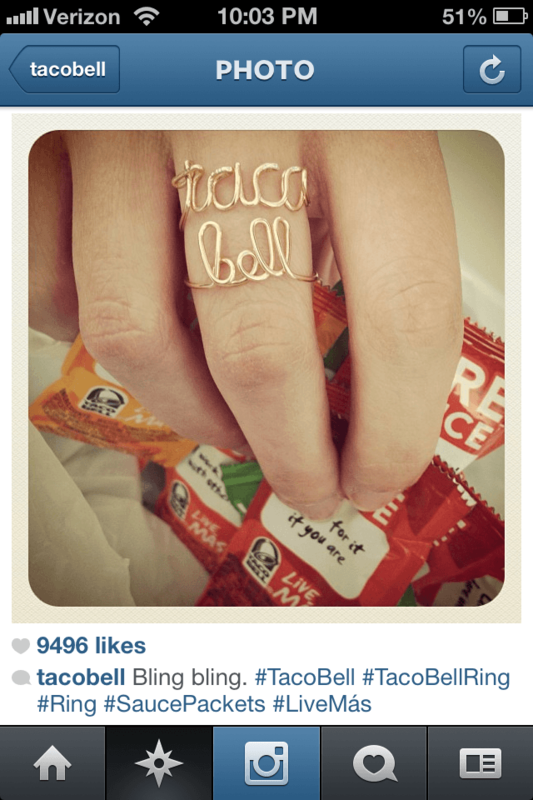 In another clever campaign, the company had customized rings made that spell out Taco Bell in cursive and sent them with handwritten notes to woo a handful of special ladies who have publicly shared their love for the company, including Chrissy Teigen, Miss California 2012 Leah Cecil, Jessica Lu of MTV’s Awkward, and more. The end result? The gifts were so memorable that these influential ladies couldn’t help but share their one-of-a-kind swag with their fans. While it’s not clear who Taco Bell uses for sourcing their swag, with a little creativity and a little help from Google, you too can create unique items your fans will love. To commemorate the launch of Jim Beam Single Barrel, the first-ever single barrel offering, the company invited fans to submit a 50-character or less single statement that shares a taste of wisdom about enjoying a great glass of bourbon. The winning statements had a chance to be featured on the actual bottle labels of Jim Beam Single Barrel. Each winner also received an authentic Jim Beam Single Barrel Bourbon barrelhead, customized with their name and statement, autographed by Fred Noe, Jim Beam’s 7th Generation Master Distiller. The two Grand Prize Winners also reportedly received a private bourbon tasting in their hometown with friends and Fred Noe. This approach works especially well when paired with a product or service with a passionate fanbase behind it. It certainly doesn’t hurt that Jim Beam had the ability to create and distribute personalized bottles. It’s a great example of playing to your advantages and using your company’s resources to go from creating a one-of-a-kind item that only a few can enjoy to delivering something the masses can enjoy. Have you seen any companies create one-of-a kind items like Cinnamon Toast Crunch’s selfie spoon? Share your best examples in a comment!